What should be done about fly-grazing? With the economic downturn pushing up the prices of hay and feed, some horse owners have found the financial demand of caring for their animals too great, prompting higher incidences of fly-grazing in recent years. Surplus stock, decreased demand and therefore decreased value has meant that many horses are at the mercy of irresponsible owners who will happily abandon them to the care of others. Unregistered breeders are common culprits of fly-grazing by breeding indiscriminately without the means to care for their animals, they need to graze them cheaply, maintaining ownership but not a duty of care. Because there are limited resources for catching offenders and because most fly-grazing takes place after dark when horses can be transferred to private fields unobserved, policing the activity is difficult. Add to this the fact that most horses abandoned in this way are without freeze-marks or microchips to identify them, making locating the owners a nigh-on impossible task. It is estimated that every year some 2,500-3,000 horses are fly-grazed in England and Wales, although the figure is likely much higher. UK law provides that any animal left on private land becomes the responsibility of the landowner for a minimum of 14 days, after which time, providing abandonment notices have been distributed and the animal has been reported to the police, the horse becomes his property. This means that for a fortnight, the duty of care resides solely with the landowner and to remove the animal (destroy it or act otherwise) is to break the law. The 14-day window is in place to protect any horse that is on the land by accident – either because it has been stolen and dumped or has escaped from another location – and the landowner can face a large penalty for disposing of the animal before the threshold is up. The problem is that while most fly-grazers understand the law, it does nothing to deter them. Rather, they design to leave their horses until the 14 days is up, at which point they move their animals on, doing so in a way that ensures they avoid loss or prosecution. There is very little a landowner can do, besides securing all gates, fences and other accessible areas, to prevent fly-grazers going about their business. You might say the landowner can lawfully sell a horse after a fortnight and get compensation for his troubles, but without a microchip and a horse passport (which most abandoned horses don’t have), a horse cannot be sold on. Since the 31st July 2009, both microchips and passports became legal requirements in the trade and ownership of horses, although fly-grazers are a law unto themselves and do not always abide these rules. Because of this, the landowner is placed in a very difficult situation if left with the animal after 14 days as micro-chipping, passports and humane euthanasia are often more expensive than the horse is worth. So, what does the government do to help victims of fly-grazing? Well, as it stands, very little. Currently, animal welfare laws prohibit a landowner from doing anything but care for the horses on its land for 14 days and, because of other laws, is restrictive of what can be done with the animals after this period. Selling at 'market or public auction' as Section 7 of the Animal Act 1971 stipulates, is all well and good for a solution if the Horse Passports Regulations (2009) did not also exist. Put simply, landowners are very often scuppered when faced with the issue of fly-grazing. But while laws are rigid and uncompromising in England, a new bill in Wales (The Control of Horses Act 2014) means that local authorities, police and animal welfare charities will maintain the right to seize, sell, re-home and humanely euthanise (as a last resort) any horse that trespasses private land without consent of the landowner. This removes the problem of rogue horses over-grazing the land and clearing fields of grasslands and pasture destined for the landowner's own animals. It also reduces the risk of harm coming to the farmer or landowner from animals that are unruly, distressed or unwell, as well as the likelihood of over-breeding. We have brought forward this Bill in response to incidences of fly grazing right across Wales that simply cannot be allowed to continue [...] I recognise how cruel and distressing fly grazing can be as well as causing a threat to public safety and creating social, economic and environmental harm. Clearly, many people are in agreement about the negative implications of fly-grazing in the UK, although the current laws do not reflect the collective concern. Measures to better protect abandoned horses and livestock animals from neglect and harm, as well as to support landowners in getting back and keeping their land, recognising them as the victims of crime and not holding them in some way accountable, are desperately needed to deter negligent owners benefiting from the failings of our system. What are your thoughts on fly-grazing? 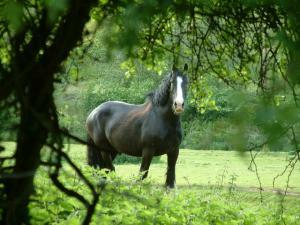 Should more be done to protect horses and landowners and bring owners to justice? Please comment below and share your thoughts with us.